so confused with my llife. does any one have any solutions to help me? The question was asked towards the end of December 2008, so the troubles had been occurring in the period of Jupiter-sun in vimshottari and continuing and perhaps worsening during Jupiter-moon vimshottari, and in Mars-jupiter in Ashtottari. From the Vimshottari perspective, Jupiter is in own house, slightly weak and a malefic for the Taurus lagna because it rules the 8th and 11th houses. Being an afflicted matrikaraka placed in the 8th with lagnesha it has the ability to give much mental anguish, lack of peace and support or care from others. It is placed in the nakshatra of venus and thus represents the effect of lagnesha in 8th house. Sun is lord of 4th and atmakaraka in debility in 6th house, again a negative indicator although being placed in close proximity of exalted Saturn one would have expected cancellation of the debilitation. Here one must remember that Saturn and sun are stark enemies and so this state of cancellation must be approached with caution. 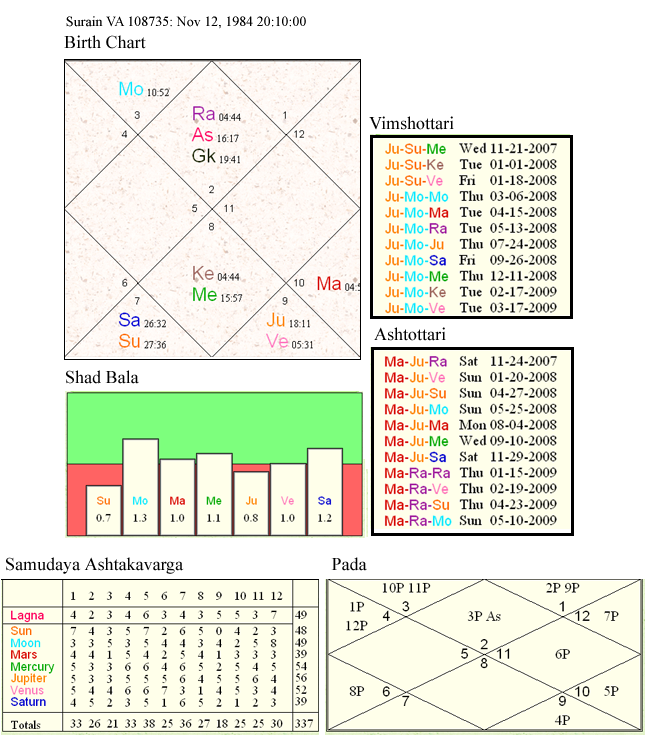 The next bhukti of moon is even more sinister because moon is the lord of 3rd, malefic and placed in direct aspect of Jupiter and venus which while intrinsically benefic are functionally not so in this chart. This chart gives a good illustration of some obvious pit-falls in general superficial approaches seen in the field. Notice also that moon is in the asterism of rahu which is placed in lagna with gulika and therefore moon bhukti will give pain and difficulty to the nativity and through relationships, lack of family support and educational activities. A feeling of uncertainty which the nativity expressed in his original plea. It is of interest to note that during the past year, Jupiter was contacting its natal placement and now in acceleration is transiting the exalted lord of 12th and 7th and mars also happens to be darakaraka. Presence of mars who is lord of 7th and darakaraka being placed in badhaksthana does not bode well for marriage prospects and the nativity will experience challenges in that area as well. Two exalted planets makes new jyotishis jump with glee but a bit deeper consideration is required as in this case. Given the situation, Jupiter-mars vimshottari bhukti does not seem very promising either. This nativity was born after sunset in krishnapaksha and according to Parashara ashtottari dasha system applies in this case. Mars though exalted is in badhaksthana and is placed in Uttarashadha. Although in this case it does not matter because both Saturn and sun are placed in the 6th, but in ashtottari system Uttarashadha would represent the domain of Saturn and not sun! This is because Ashtottari has a slightly different system of assignment of planets to stars. For someone with moon in uttarashadha, the birth dasha will be of Saturn and not of sun as would be the case for the individual in vimshottari system. This is important to remember. The Jupiter bhukti in the mars ashtottari dasha is difficult because Jupiter is a malefic, placed in the 8th house (and other malefic factors discussed earlier) is placed in the 12th house from dasha lord. When bhukti lord is in 12th or 6th or 8th (trika) from mahadasha lord, it represents a difficult time. From a nakshatra point of view, Jupiter is placed in purvashadha which falls in Saturn’s sector as well, in the ashtottari scheme and is similarly afflicted as is mars. The transit of Jupiter and Saturn are not helpful either due to Saturn being in 8th from dashanath and affecting the fourth house of mental peace and Jupiter crossing the dashanath firstly in the 12th from it and then in debilitated accelerated state currently. When significant effects are to be experienced, these tend to be prominently displayed through different lenses that Jyotish offers for studying. 3 levels of Awasthas (Jagratadi…): Represented as level of awareness, the three states are Awake (own or exaltation sign), dreaming (friend’s or neutral planet’s sign using the panchadha aggregate friendship classification) and asleep (enemy’s or debilitation sign) states. 5 levels of Awasthas (Baladi…): Represented as the age of planet, the five states are – infant, child, young adult, aged, dead. In odd signs, the first six degrees represent the infant, then next six degrees the child and so on. In even signs the progression is inverse, the first six degrees represent a dead planet, the next six an aged planet etc. – Planet in the 5th house in conjunction with rahu or ketu, Saturn or mars. – Planet in exaltation sign or moolatrikona zone. – Planet in enemy’s sign or conjoined with enemy or aspected by enemy. – Planet in a watery sign, aspected by a malefic and not associated with a benefic. – Planet in a friend’s sign or aspected by a friend and conjoined with Jupiter. – Planet in conjunction with sun and aspected by malefics and an enemy. Planets in lajjita, kshudita, kshobhita and trashita create miseries and lead to disruption of the house they are in. Lajjita being the best of these four states will give something and will not be totally destructive. The house occupied by these planets is more affected than if the house lord is in one of the four states. For example the lord of 3rd house in kshobhita state in the 7th house will represent worse effects for the 7th house and not the 3rd. The six states represent worldly benefit and losses, health and happiness. 9 levels of Awasthas (Deeptadi…): Represents the emotional state of spirit Deepta/Brilliant (exaltation), Swastha (own sign), Pramudita/Joyful (extreme friend’s sign), Shanta/Contented (friend’s sign), Deena/Deficient-Humble (neutral’s sign), Dukhita/Sad (enemy’s sign), Vikal/Anxious/Panicky (with a malefic planet), Khala/Malicious/Wicked (inauspicious sign – debilitation), Kopa/Infuriated (conjoined with sun). The effects of a planet are expressed fully in the first three states, medium in the next two and little or nothing in the remaining four. 12 levels of Awasthas (Shayanadi…): Represent the diurnal state of the planet as these represent the normal activities to some extent. The calculation etc are covered in texts such as Brihat Parashar Hora Shastra and can be consulted. The states are Shayana (Recumbent), Upaveshana (Sitting), Netrapani, Prakashana (Alert), Gamana (Leaving), Agamana (Arriving), sabhavastha (in society, at work), agama (Returning Home), Bhojana (Eating), Nrityalipsa (Entertainment), Kautuka (Pleased) and Nidra (Asleep). The next step involves the derivation of the sleeping and awakened states and are related to the degree of expression of a given planet. It must be noted that there are some variations of opinions regarding the calculations for this kind of awastha. Parashara describes these states almost towards the middle of BrihatParashara Hora Shastra in Chapter 47 (Sharma-Sagar 1994 edition) after having described most of the basics and some advanced techniques and considerations to be used by Jyotishis. Easing into Awasthas: For beginners the simpler consideration of the 3, 5 and 9 awasthas during their examination of a horoscope will be an easy way to become familiar to these factors particularly when they are wondering about dasha effects and how those will be experienced by the nativity. For those who are more of a mathematical-scientific inclination, each of these three divisions can be given a weighting of 1/3rd weight each. While doing so one must not lose sight of the fact that this kind of quantitation is just for simplifying conclusions or bottom lines and are not absolute measures or quantities. It is more practical to think of these as tools or aids that help us determine if a planet will be helpful or derogatory, strong or weak, expressive or ineffective in a global assessment of the different awasthas. One must also remember that awasthas are but a consideration and are not a black and white factor or absolute. Barack Obama was born in krishnapaksha and pretty close to sunset hence the chart would respond better to Ashtottari dasha. During the last few months of his campaign and election time, he was experiencing the combined period of mercury-jupiter and venus. Mercury is dreaming, old and deficient while jupiter is asleep, old and wicked. On the surface it would seem like the person was not slated for a win, if we only took the awasthas in consideration! However, note that the Deeptadi (9) awastha was based on the debilitation of jupiter and the inimical sign dispositor for mercury. This is where the 'human' wearing the thinking cap comes into play! Jupiter has cancellation of debility due to the presence of saturn (lord of makar) in kendra from Jupiter in own sign. Obviously Jupiter is not debilitated but much strengthened thus functionally faring a lot better than the Khala awastha assigned to it at first. An example of neecha-bhanga raj-yoga, one would say! Being the head of the State requires a lot of maturity and wisdom and thus the role is of an older and wiser individual which Obama has impressed people as being, despite his young age and youthful appearance. So the old age state of jupiter in baladi (5 levels) is appropriate. In the Jagratadi (3 levels) consideration too, Jupiter gains awastha strength due to the cancellation of debilitation. The state of sushupta (asleep) based on placement of jupiter in debility would be reversed due to cancellation. So, what appeared as a weak, ineffective period was indeed extremely strong! Mercury, the bhukti lord comes out as dreaming (house of neutral), old (house of enemy) and deena or deficient (neutral's sign) and so overall mediocre as per standard awastha determination. One must not lose sight of the fact that moon, the dispositor of mercury is exalted, the strongest planet in this chart in shadbala and in awastha too and well placed in a trikona. This obviously boosts the state of the mercury and must be intelligently considered. Furthermore, mercury participates in a budh-aditya yoga with strong sun and imparts the high level of intelligence and breadth of knowledge to Obama, as also the gift of oratory. The antara of venus was operating and it is dreaming, youthful and happy states. This fits very well with the charm and public appeal of Obama and placed in the 6th house also indicates victory over a female opponent in a touch and go primary selection against Mrs. Clinton. As the historical drama was unfolding, Obama lost his grandmother who had a very formative role in his life and upbringing. Mercury is a matrikaraka and in a sense the grandmother was really a mother to him. The 7th house represents grandmother (4th from 4th) and is ruled by moon and houses mercury. Sun the maraka for this house is placed with the matrikaraka and is aspected by saturn the other maraka (being lord of 7th from the 7th) from the 1st house. Venus is placed in the 12th from the 7th and in the 2nd from moon and gulika. The pattern fits the event that occurred. The cloud that overhung Obama through his association with his earlier pastor and spiritual leader could be seen as an illustration of what some say about planets with cancelled debility. The effect while mostly reversed does leave a few personal challenges in the lives of such nativities. 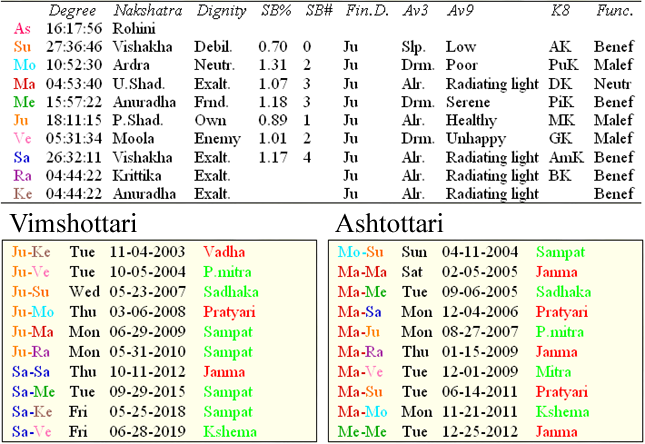 I have utilized this somewhat difficult chart because it illustrates several principles, such as the verity of using Ashtottari dasha in krishnapaksha charts, and the importance of an intelligent consideration of awasthas, and not blindly applying those, using simple and obvious logical reasoning as described. Karma-phal or fruits of Karma is primarily what astrology is supposed to decipher and advise nativities with. Twelve rashis (in sixteen vargas starting with kshetra or Rashi kundali as it is popularly known as), nine planets, 27 /28 nakshatras (28 in the case of ashtottari) arrive in many different permutations and combinations to enact the Leela of Karma in individual charts. Astrologers are divided in their verdict as to all our experiences in this world, known as “human experience”, as being purely destined or mixed with some freedom of choice too. It would make it very confusing if destiny was the sole factor because then any further decline or ascension would not be our choice but of our destiny. Why even try then, if there is no room for personal choice, decisions, judgments and actions! And if such were the case then how was the original karma, the original sin that plunged us into millions of repetitions of births, mostly from one painful experience to another with moments of joy and bliss sprinkled here and there? While it is conceivable that there are effects that are beyond our control and are to be experienced, like it or not, there are also opportunities that give us back some control in this never-ending (it seems!) Ferris wheel of rebirths! The Hindu concept of Karma is actually pretty complex and rich in details, presented here briefly. Without knowing a bit about it, astrology becomes confusing and futile! ‘Karman ki Gat Nyaari Uudho’: The great mystic Meerabai in few words captured a world of experiential reality that baffles all of us! There is some diversity of opinions amongst astrologers regarding which planet indicates one’s karma. Those that follow Shri M.C. Jain’s karmic control theory side with lunar nodes, particularly rahu, others maintain that Saturn is the kingpin, and still others perhaps also rightly indicate that since a horoscope at birth is the product of karma that went before, all planets and houses perhaps have a say in karma. However, as described in my primers freely available on web, many years ago I had described using Dr. Deepak Chopra’s chart that the planet or house from which Saturn is placed in the 10th house holds an important key to deciphering a primary karmic lesson that needs to be addressed during this lifetime and in a sense holds the promise and potential that the maya represented by that house shall be addressed and the veil removed from one’s eyes. In that sense, Saturn has an important karmic indicator role to play. By extension, should such a planet from which Saturn is in the 10th were to be placed in the 4th navamsha from Saturn, it becomes especially significant. This is because the said planet will be approximately 90 degrees away from Saturn and in close orb-contact. However, this is a finer point and not absolutely essential for the effect to be seen or experienced. By extension, the dashas of Saturn and the planet etc that it is in 10th from or the planet that are in the stars of Saturn and this said planet would bring on this kind of a karmic experience! Krishnamurthy’s Theory: K.S. Krishnamurthy, from all accounts, was an uncannily accurate astrologer who developed an interesting system popularly known as Krishnamurthy Paddhati or K.P. as is popularly known. He primarily used it for horary or prashna Jyotish but the principles work in natal or phalit Jyotish as well. Very briefly: His system utilized the planets ruling the weekday, the asterism that the Moon is in at the time of asking of the question and the ascendant rising at that instant. The system was claimed as capable of providing highly accurate readings and Krishnamurthy acknowledged having received the 'method' in the form of a divine inspiration from his Ishta Devta Uchchista Ganapathy. He chose to use the western placidian house divisions with these sidereal charts, a major divergence from classical vedic astrology; moreover, he placed the rising degree at the beginning of a house and not in the middle as is practiced by other jyotishis. His 'system' also had another interesting feature. Since the zodiac can be divided into 249 divisions, each ruled by a sign-lord (one per 30 deg), star-lord (one per 13 deg 20 min) and a star-sub-lord (variable dimensions, 40 min to 2 deg 13 min 20 sec), he often asked clients to provide a number between 1 and 249 which he used to determine the ascendant in a chart drawn for the moment of the query (planetary longitudes were calculated for the actual current moment). A client providing a number that was outside this range was told that the venture would not be a success! Subdivisions: The KP subdivisions are essentially a way of viewing the vimshottari bhukti or antardasha in terms of nakshatra longitudes. We all know for example, that, if moon is just entering krittika, at birth, the child will begin life with sun’s dasha. If the moon has just entered krittika the child will have sun dasa and sun bhukti at the beginning of life. If the birth moon is a bit more advanced, the child will begin life with sun dasa and moon bhukti and thus depending on how advanced the moon is at birth in krittika, the first bhukti could belong to mars, rahu, Jupiter, etc. Now view these segments of krittika as subdivisions, with the first segment ruled by sun (sun bhukti), next one ruled by moon, the third by mars and so on. The dimensions of the segments would be proportional to the proportion of the bhukti to that of the dasa (nakshatra). Looked another way, Venus dasa rules for 20 years whereas moon dasa rules for 10 years. Both moon and Venus nakshatra would have nine segments each ruled by the nine planets, however, each segment in Venus dasa would be twice as large as the segment ruled by the same planet in moon dasa. According to Krishnamurthy the nakshatra dispositor of the dasa lord defined the nature of the result whereas the dasa lord was treated as the source of the effect. The ‘sub’ then determined the positive or negative outcomes, gain or loss of the effect. So, for illustration let us say a person is undergoing the dasa of the lord of 10th house which is in the nakshatra of the lord of 11th. This would be interpreted as the source (tenth = workplace) giving the effect of 11th (raise or bonus) with the subdivision indicating a gain or a denial of a raise. The relationship between the dasa dispositor (effect) and the sub-lord would have a say in whether the effect will be positive or negative. So in our example if the sublord is placed in a trika sthan (6, 8 or 12) from lagna or from the dasa dispositor would indicate a loss but placement in 1, 5, 9 would indicate the individual getting a raise. In actual experience, the effect being defined by the dasa dispositor works out more reliably than the role of the sub-lord in birth charts. Some individual, on the other hand, have demonstrated very good results when using KP in a horary application, much better than in natal horoscopy, much in keeping with what Krishnamurthy originally proposed and utilized this very interesting technique. Through this method, Krishnamurthy revived a very important fundamental concept on the Indian astrological scene, that of the role of asterisms in chart analysis and particularly by refining the use and improving the usefulness of the vimshottari dasha system of timing. He must be commended for that, even though his system remains a somewhat controversial approach for many main-stream jyotishis. The system is essentially not very different from that used for delineating any other chart as per jyotish parlance. The chart is drawn by using either the numerical representative for the ascendant, or for the epoch of the query. The planets in both cases are calculated for the moment of making the query. A list of significant planets are drawn; the planet ruling over the weekday, the lords of the signs, stars and subs of the rising degree (ascendant) and the Moon. The ascendant is taken to represent the client while the seventh house represents the astrologer. 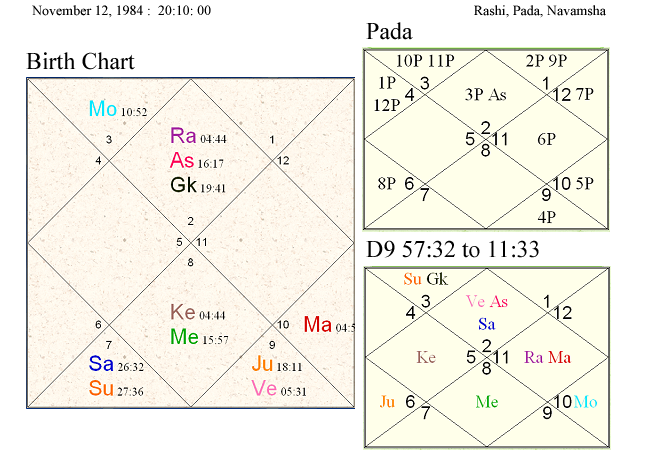 When the astrologer also happens to be the querist (self-prashna), it is interesting that at times this is indicated in the chart itself in terms of 'connectivities' between the two representative houses. Next, the house/houses pertaining to the question are examined and these are checked to see if they agree with the significant planets. The success or failure of the undertaking then would be indicated by the mutual agreement or disagreement between the planets. Things such as friendship (or lack thereof) between the planets concerned, their association with each other by aspect, any beneficial combinations (yogas) between relevant planets and the strength of the planets are taken into account. An examination of the vimshottari dasha is then made and this is used, in addition to transits of the significant planets and stars for estimating the timing. Situations where the indicators are fewer and clear, the outcome can be expected to be better predictable. If too many conflicting influences exist, there is usually reason to believe that the issue is riddled with problems. In his writings, Krishnamurthy gave numerous examples of things such as long-distance phone calls that he tested his system on. This might amuse the modern reader who is used to dialing a number and expecting to get through right away. But in India of years ago, decades before direct dialing became available, one had to place a call by 'booking' it through an operator and then wait and wait and wait, often at the post-office because most people did not have personal phones. It was a big deal for most and Krishnamurthy used it to test his system. Perhaps we can emulate Krishnamurthy’s experiment with our postal-mail, these days! Very thought provoking article Ranjanji. Just one request can you please shed some light on 3rd lord been placed in 2nd (12th from own house) of this individual. Will it not affect its courage of facing situation. The reason of asking this is because I had similar placement, tula lagna Jupiter lord of 3rd house placed in 2nd with GK. I had hard time starting new things, expressing my thoughts and courageous facing things. Also, is there any remedy for this situation.